A pink-maned pony spotted around an island in Montreal, Canada turned out to be less a magical creature and more of a viral internet hoax. Pictures of the creature went viral, and sparked elaborate search efforts by park officials, professional animal rescuers and media. But in the end, comedic web programme the Vlog announced it was a part of a "viral internet experiment". Notice of the hoax circulated Wednesday afternoon, after two days of searches. 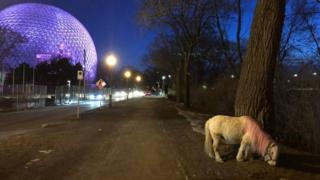 The pony was purportedly lost in the wilds of Île Sainte-Hélèn, which is part of Parc Jean Drapeau. Several pictures of the beauty were posted to a Facebook group devoted to sightings of the miniature equine. It is unclear if the group was part of the hoax, but it was removed from Facebook shortly before representatives from Vlog made their announcement. "Will we be able to catch it? Poor little one... we should also find him a name, what, do you think?" wrote one follower on the now-defunct Facebook page. Members of the Society of Parc Jean Drapeau, which is in charge of the island, have been searching since Monday for the pony. "Our teams on the field are vigilant and are actively looking for traces of the animal. To date, however, we have not seen it on the field and our cameras have not allowed us to find it," spokesperson Gabrielle Meloche told the BBC. Animal Emergency and Rescue Service, a company that helps find missing pets, had also gotten involved. About 10 staff members were patrolling the island by foot and by car, shaking a bucket of grain to try and lure the pony out. "We have a lot of eyes on the ground," co-ordinator Isabelle Vachon-Girard told the BBC. The team had employed a drone to try to locate the pony from the sky and was considering bringing out a sniffing dog. "Unusual or not, we always take seriously the situations of animals in distress, and have deployed material and human resources for that," the company posted on Facebook. "We immediately withdraw our staff on the field. We will not post any comment about this event."